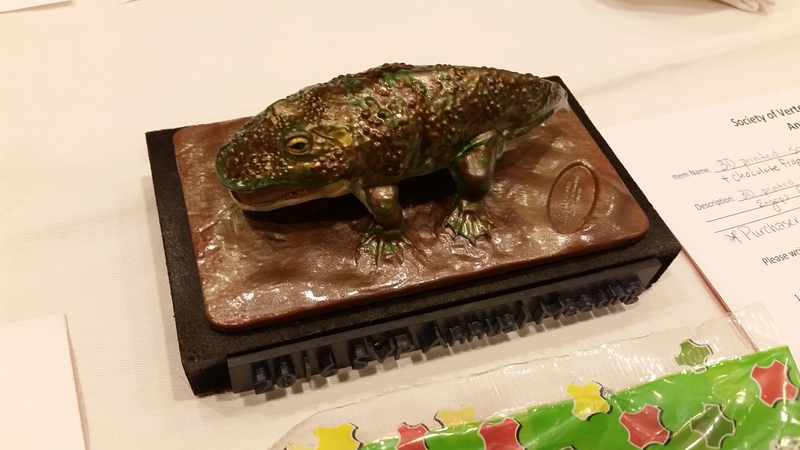 This year’s SVP in Salt Lake City was chock full of exciting dino stuff. My first visit to the Natural History Museum of Utah since its move to a brand-new building (I last visited in December 2008, just prior to its move) during the conference’s opening reception was a real treat. 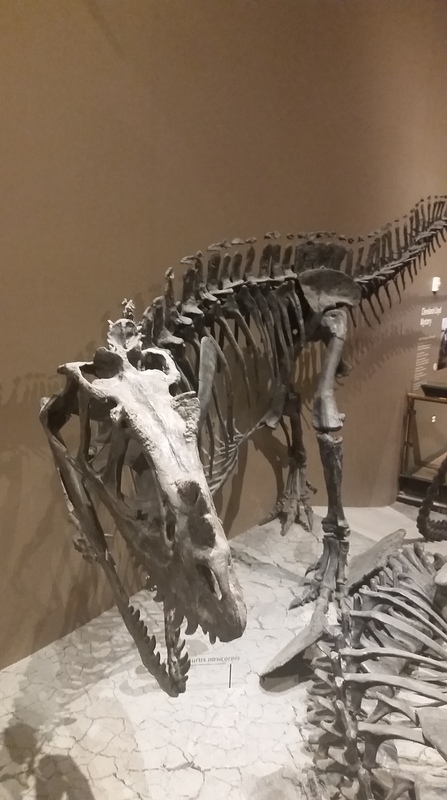 Utah has such a great fossil record for dinosaurs, and it was awesome to see new takes on old classics like this Ceratosaurus – take note of the osteoderms running down the midline of the spine! 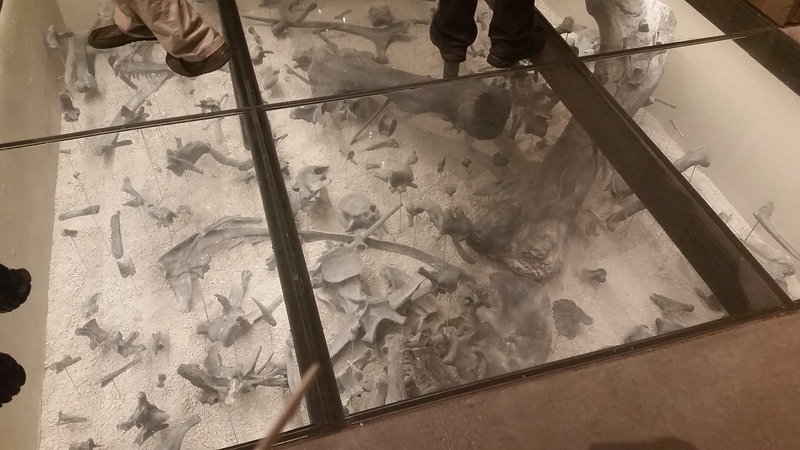 Also extremely excellent: not one, but TWO glass floors over bonebed recreations. This is the famous Cleveland-Lloyd bonebed, full of classic Morrison dinosaurs like Allosaurus and Diplodocus. There was also a Gryposaurus quarry from the Kaiparowits Formation. Great stuff all around, possibly the only type of display I enjoy more than Walls of Stuff. 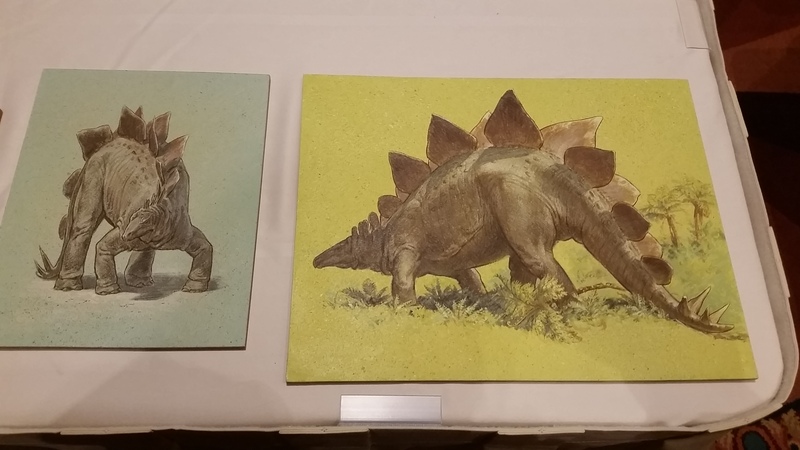 The Jurassic dinosaurs might be the best known dinosaurs from Utah, but the record of Cretaceous dinosaurs from Utah is slowly being filled in. 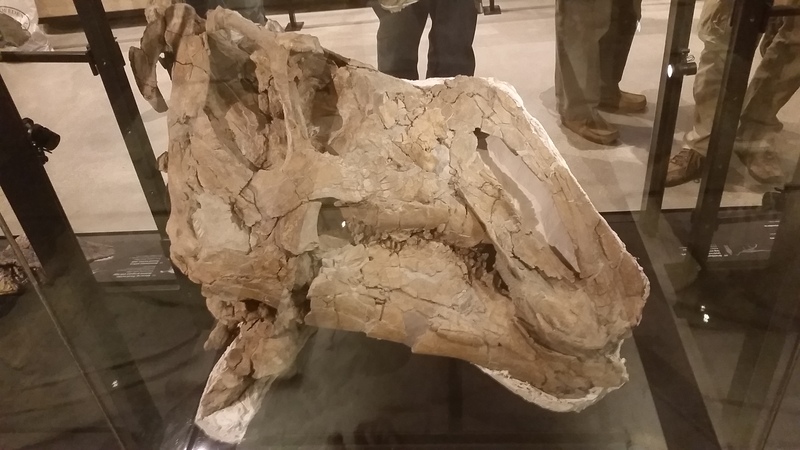 There were excellent displays of material from the Kaiparowits Formation (similar in age to what we find in Alberta), like this beautiful Gryposaurus skull and some excellent ceratopsians, as well as dinosaurs from the earlier Cedar Mountain Formation. There are some cool dioramas scattered throughout the galleries that bring the fossils on display to life. 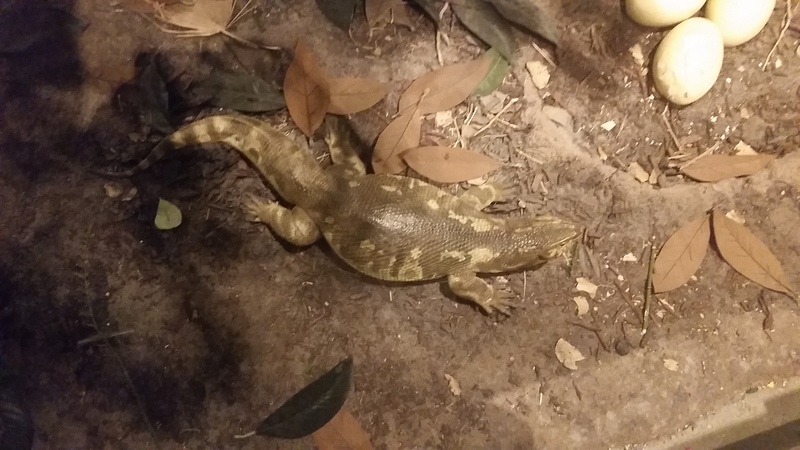 These reward close inspection of the corners and crevices – I was delighted to see this little varanid lizard skulking at the corners of a dinosaur’s nest. 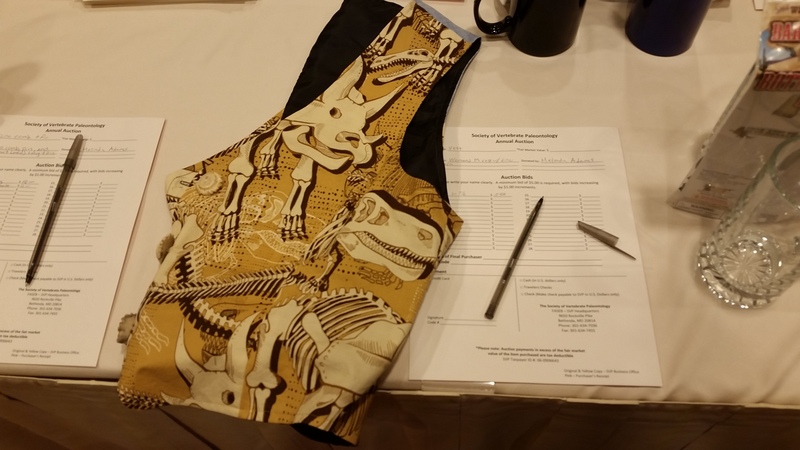 The SVP fundraising auction is another great opportunity to spot new and vintage palaeo-art, dinosauriana, and amazing crafts by society members. This spectacular Eryops would surely have come home with me if only I had an unlimited budget. And I would literally wear this vest every day in the field if it had been in my size. The 90s nostalgia was strong with this one, a truly amazing set of Dinotopia enamel pins. Amazing!! And whatever delightful nonsense this was, we need more of it next year. SVP is a great chance to share new science and also geek out over goofy things with my colleagues. If you haven’t done so already, please check out my previous post about SVP presenters and how you should tick the box to to opt in to an oral presentation at next year’s SVP in Calgary. See you in my frozen homeland next August! Oh man, I remember those silly car toys! I used to see them all over the place back in the 90’s. 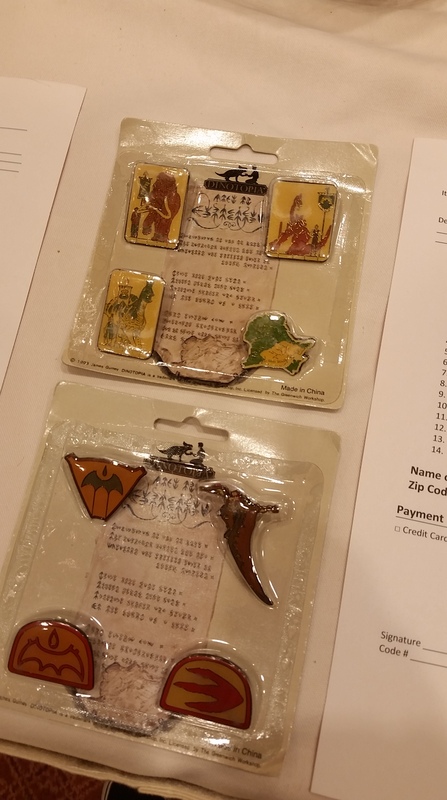 Those Dinotopia pins are pretty cool too. I’m very curious about this enigmatic Bill Berry person after seeing the LITC post.